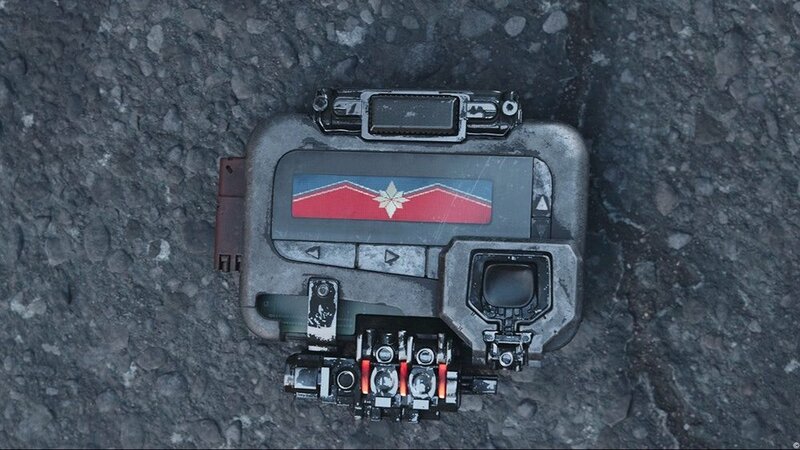 Captain Marvel's signature catchphrase is stated once in her solo debut movie, and that was cool, but did the film really capture that? Did Brie Larson’s Carol Danvers really go above and beyond? Let’s talk about what the movie did right and what went wrong in the Backpacks & Controllers review for Marvel’s Captain Marvel. Spoilers will be scattered throughout this review. Please come back after you watch the movie. Thank You! Marvel’s Captain Marvel starts at the end of the character’s story. She wakes up on Hala, the Kree homeworld, with no long term memory. 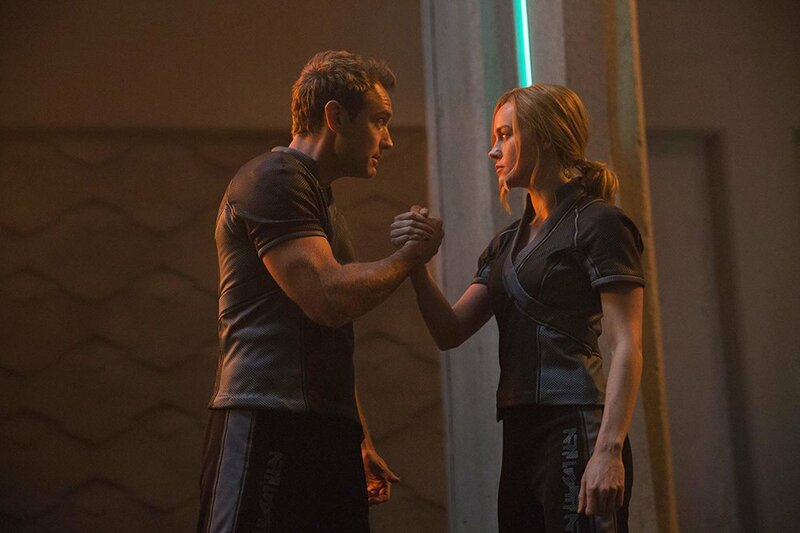 When Carol introduces us to Jude Law’s Yon-Rogg, we feel a sense of friendship, but also a student and teacher relationship. Both characters share banter during training, and you get a feeling for their relationship that has had some time to develop. “Some” is the important word in that statement. I’ll speak more to that later. Captain Marvel, or Vers, is a Kree soldier who possesses these gifts that no one else has, but she doesn’t question it. Does Vers believe that her powers were just handed to her? Vers was given a blood transfusion from Yon-Rogg, but does she think that her abilities were delivered that way? He uses a sidearm and force guantlets not energy blasts. I can already see gaps of information here. Vers is the new cadet on Yon-Rogg’s Kree team, and upon meeting the rest of the team, it becomes apparent. Her conversation with Gemma Chan’s Minn-Erva and Djimon Hounsou’s Korath is playful. The group jokes and has a family-friendly locker room discussion before their commander Yon-Rogg enters the ship, and they immediately tighten up like trained soldiers. We don’t really have much time to learn more about these side characters though. Korath has been in two movies, and all we know is that he is Kree and he likes swords. Minn-Erva, who is a fan-favorite comic book character, and isn’t even close to what she is in the comics. How they got this rifle-cuddling sniper from a genetic scientist is beyond me. My only guess is that it works well with the war theme of the movie. The Supreme Intelligence is a comic book legend. The being is an AI that has been put together by the Kree race using the minds of many of their most brilliant citizens. This may not have to be stated in Marvel’s Captain Marvel, but it is briefly mentioned among the Kree characters. The Kree follow this computer as if it is a god, but what are the motives of the Supreme Intelligence? Is someone altering its directive? In this movie all it wants is war, but later in Guardians of the Galaxy, we are told that it has signed a peace treaty. I hope this will be explained, but for now, we are left wondering. Planet C-53, or most notably, Planet Earth is where most of the situation unfolds. It’s 1995 and S.H.I.E.L.D. is doing their world patrolling thing. A young Nicholas Joseph Fury is investigating an odd Blockbuster occurrence and finds someone who will alter his entire life. 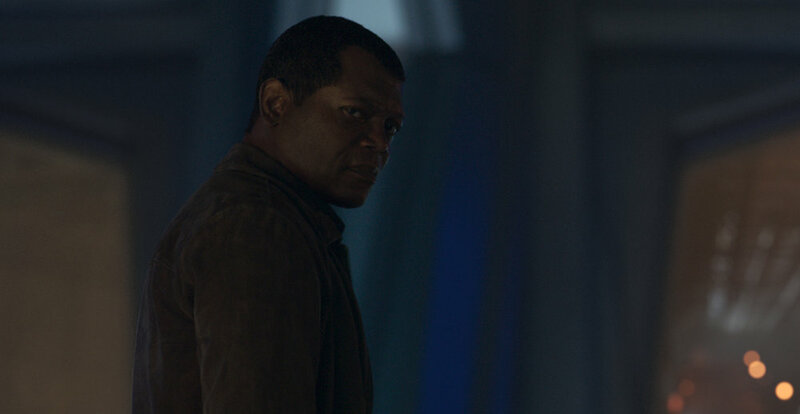 Samuel Jackson and Clark Gregg went under the CGI knife to give their characters a younger look. For some viewers, this was distracting, but it didn’t really bother me too much. I have learned not to stare too closely at these type of facial alterations that happen so often in movies today. Samuel Jackson's Fury and Clark Gregg's Coulson have not changed much as characters. Besides Fury having both eyes and Coulson’s full head of hair their characters remain similar to every other Marvel movie and/or show they have been a part of. Coulson has little screen time, but his role is loved by so many that seeing him act as a Skrull was surprising at the moment. The initial interaction of the S.H.I.E.L.D. agents and Captain Marvel at the payphone had an awkward vibe. No one really knew how to get these characters to start working together. The character lines were somewhat rushed and broken. While Vers was asking about Planet C-53, neither agent was confused by her questions or her outfit, and they didn’t even mention the odd situation until much later in the film. At this point in the film, we begin to see Yon-Rogg’s true colors. He isn’t the friendly yet strict teacher we initially thought. He is a ruthless leader who will stop at nothing to get ahead. Captain Marvel isn't even surprised to find out that Yon-Rogg has betrayed her. There is no talk or surprising moment. They just start fighting each other. It is like Yon-Rogg and Carol were not even friends, to begin with. Yon-Rogg doesn’t act friendly with his superior, Ronan, who is trying to help catch Captain Marvel. Who is Yon-Rogg trying to impress? I like Ronan in the comics, I think he has had some interesting run-ins with the Avengers because of his twisted sense of righteousness. We get a taste of his command in this movie, but there is no real payoff. He sends out a small fleet of space fighters only to be blasted away by a constant flow of hand blasts by Captain Marvel. Sorry, Lee Pace. The Skrulls in Captain Marvel were a welcome addition to the story. I really enjoyed the constant worry of “Who is a Skrull,” from all of the characters. Some of them really caught me off guard like when they take the young girl hostage. My only issue is that when the Skrull were in their natural form, they looked rather stiff. Ben Mendelsohn’s character Talos had a rigid face. He couldn’t show any real emotion, and I think it stumped his acting capability. I hope this can be corrected the next time we see the Skrull; if that ever happens. During Captain Marvel’s climax, we really start to see Carol’s abilities. Yon-Rogg’s team bring out all of their guns, swords, and gravity gauntlets to battle only to be “fisted” by Carol. 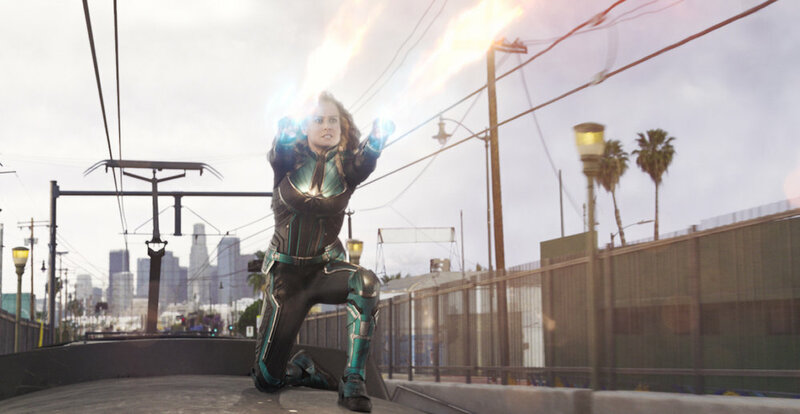 Seriously, were the directors holding back on Captain Marvel’s powers? I get that you can’t have Carol just steamroll through them because that isn’t compelling entertainment, but why couldn’t she just do one more thing? The introduction of her flying was a fantastic moment, and I wanted more of those moments. As she fell from the sky, the audience feels a sense of helplessness. The shaky camera had me grasping for the corners of my chair’s armrest, and when we see her rise up and fly; it is a fantastic moment. Then she just continues to fist all of Ronan’s ships. Overall, I think Captain Marvel was a fun movie, but there was nothing that blew me away. I don’t think they went higher, further, or faster. The movie landed softly and safely. There was no real “Wow” moment in the film, and there was no fear of losing anything either since we know all of these characters are alive in later films. I think this movie would have done much better if it had been done way back in MCU Phase One. I am really excited to see what Captain Marvel contributes to the Avengers team in Avengers Endgame. The fact that her powers come from an Infinity stone, much like Scarlet Witch, is a clear indication for her power scale in the MCU and if her comic book abilities are taken into consideration, she is a force that is not to be messed with. Also, it has been almost 20 years Captain Marvel has returned to Earth. What has she learned since then? Has Carol become more powerful? Has she fisted more villains? There are a lot more questions then there are answers, and we will have to wait for Avengers Endgame to get those answers. Newer PostWhat Do Gaming Subscription Services mean for the Games Industry? Older PostAre Mobile Games That Bad?